ROARING FORTIES™ SMA2750 PRO series is AUSTRALIAN STANDARDS APPROVED & Manfactured in Australia. This AS 4758 & ISO12402-3 approved PFD Type 1 operates with a 60g CO2 disposable cylinder. It has a mouth tube, whistle, light, SOLAS approved reflective tapes & a lifting handle . I t also has a across crutch strap arrangement with stainless steel fasteners. 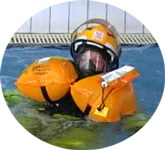 It has more than 275 Newtons (61lb or 28kg) of buoyancy & can right & support a fireman in full uniform with his/her breathing apparatus (including steel/fibreglass wrapped compressed air cylinders) at an inclined but safe face-up position. Optional attachments like J knife, EPIRB etc can be incorporated into the device. It can be inflated either with manual/oral mechanism or automatic/oral system. It can also comes in a fire retardant (Nomex or polyurethane coated Nylon) valise. Safety Marine Australia allows corporate logo to be displayed if required. This inflatable lifejacket is not ideal for leisure activities. It is more applicable for commercial and defence purposes where heavier than normal clothing & equipment are used by the wearer. It will float a CFA personnel (male or female) to a safe & comfortable inclined position even if he/she is carrying a fibre glass oxygen cylinder on his/her back. Our Victorian MFB/CFA front line personnel use our equipment. 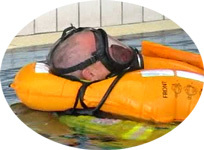 It must be added that our inflatable PFD/lifejacket are made to last and economical to maintain & repair.